Solaf is a Nord lumberjack and the proprietor of Gray Pine Goods. He lives there with his brother Bolund who runs the Falkreath lumber mill. He has 750 gold available for bartering and he will buy and sell any type of item as he is a general merchant. He wakes at 8am and opens his store for business. At 8pm, he closes it and heads to Dead Man's Drink for three hours, then goes back home for sleep at midnight. He wears a set of farm clothes and a pair of boots. He is equipped with an iron dagger, and carries a key to his store, as well as a selection of common items and gold. When you first speak to him he will cheerfully greet you with "Well met. Unlike my brother, I've no dislike of strangers. Met lots of 'em while I was a Stormcloak. ", "Can I get you something? ", "Looking for something? ", "What do you need, stranger? ", or "Don't mind Bolund. He's young and gets riled easily." He is very paranoid about potential theft, and when exiting conversations he will usually remind you, "Steal anything from my shop, and you'll regret it." Alternatively, he may end conversation with a friendlier "Be seein' you, stranger." His paranoia also shows when you are browsing his store, as he can be found warning you with either "Look around all you want, but don't try anything funny." or "Hey! You planning to steal something? Don't even think about it." Asking him about the fact that he was a Stormcloak will cause him to remark, "I was once, but not any more. I was wounded in a skirmish up near Windhelm. This was years ago, mind you." He will then go on to say, "Now, maybe I don't pick up a blade in Ulfric's name no more, but I still hold with his ideals. Skyrim is Nord land, and we ought to rule it. We don't need no help from the Empire on that count." Should you ask about his brother, he'll tell you, "His name's Bolund. He's the one who works the lumber mill down by the river. If you meet him, don't expect much in the way o' conversation. He ain't one for talking, especially with folk he don't know." Bolund: "Another day in this graveyard." Solaf: "Falkreath is a fine place to be, Bolund." Bolund: "Falkreath is where people go to die. We could be fighting, taking back Nord land!" 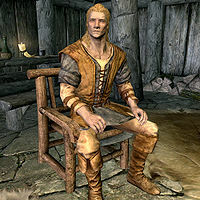 Solaf: "Falkreath is our home, a place where we have good jobs under a good Jarl. Until the war comes to us we stay put." Solaf is briefly mentioned in Runil's journal. This page was last modified on 1 September 2014, at 19:59.